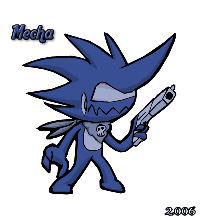 Recently he updated his Character's appearance by adding a few exterior accessories to Mecha. "Time to redo my wiki"
Mecha is "an oldbie" in his own words, a self-proclaimed "awesome member" and on the whole, a stuck-up jerk. Not that he isn't lovable, He's made plenty of friends and is friends to plenty but his attention to members is short often relying on his inability to remember names. If he can't remember who a member is, he tends to not care how he treats them and is usually a jerk. Mecha joined MFGG in 2005 and after the first year of his membership began to notice his significance in the boards. From late May 2005, til around November 2006 he had a well known "love affair" with Princess Pie. The relationship was a joke partnership and had no real significance in either of the two members eyes. It was mostly brought up as an anchor point for themes involving couples such as Mecha's CaveStory edit MFGG Story, Where Mecha played the protagonist "Quote" and Pie played "Curly". By 2007 Princess Pie had left MFGG and began posting at the MFGGU. Mecha took a brief leave from MFGG during this time and when he returned many of his MFGG friends had left for other interests, but his long-time pal Sasuke (Sasuke-San) had remained. The two formed a team as a joke known as "Team Baby Fu**ors" and Mecha took it upon himself to make a couple of random signatures based off it. On June 18 2007, Mecha decided to make another team with Marty and NO Body known as "Team ShortStop". This sparked the team fad back to life and more teams came along. Team ShortStop has become nothing more than a couple of member's pictures in a few scattered sigs much like most teams, but team Baby Fu**ors is still alive as Mecha and Sasuke tend to chat together a lot more and are often the muse for evil duos on MFGG. This page was last edited on 29 April 2015, at 00:47.